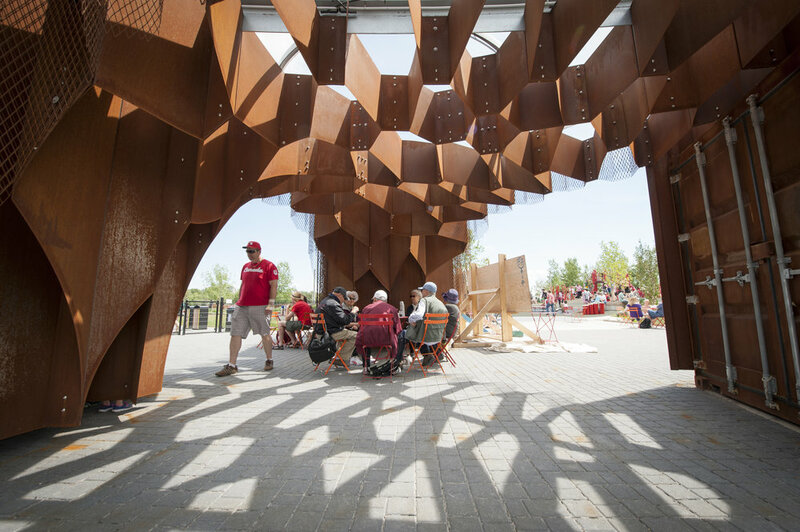 Crossroads is the final puzzle piece in the pedestrian pathway that links key elements of East Village: the George C. King Bridge, RiverWalk, the Riff pedestrian street and Fort Calgary. 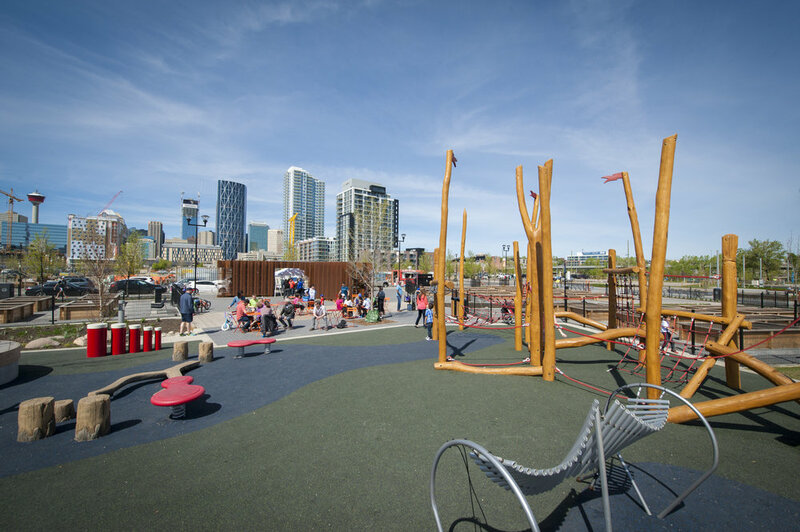 This thoughtfully-landscaped area is designed by the renowned Canadian landscape architecture firm Moriyama & Teshima, and Calgary’s Stantec Consulting – the same team that made RiverWalk the special place it is today. At the center of Crossroads plaza is the Wheel of Women installation. 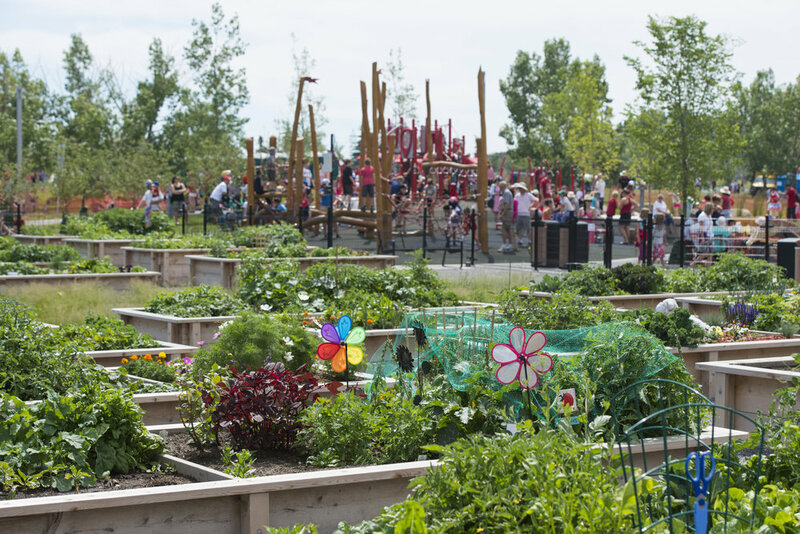 The Crossroads area offers a children’s playground a thriving community garden and an apple orchard. The East Village community garden welcomed its first gardeners in Spring 2016. The garden includes raised beds for gardeners with mobility challenges, accessible water and a communal garden shed, designed by Canadian firm 5468796 Architecture. The garden contains 88 plots, which are available for East Village residents to rent. If you live in EV and have a green thumb, you can apply for a garden plot through the East Village Neighbourhood Association (EVNA). The anchor of Crossroads plaza is the Wheel of Women - an interpretive ground-level installation that celebrates women of influence throughout the city’s history. 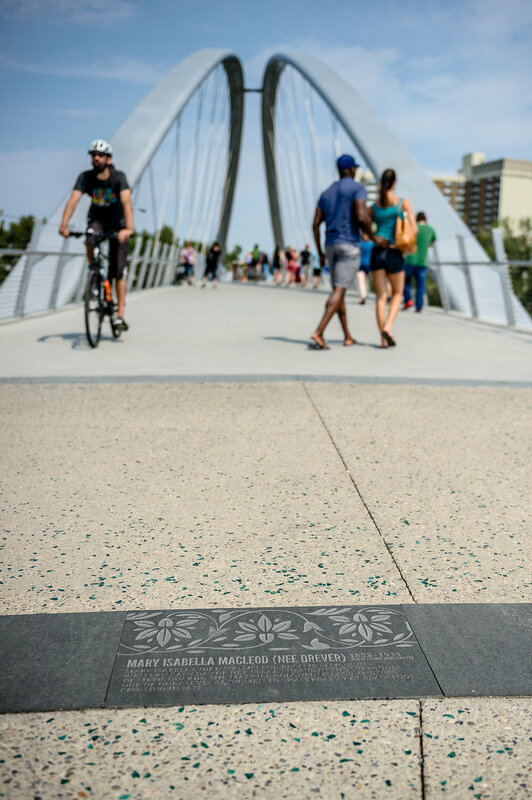 The large tile circle at the south base of the George C. King Bridge contains the names of thirty Calgarian women and their contributions to our city. Learn more about these incredible women here or by visiting the installation in person! 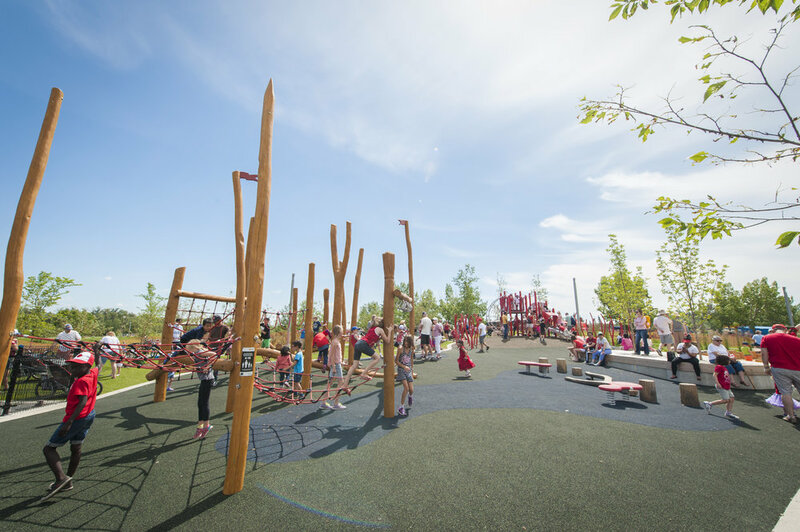 The unique equipment at Crossroads playground encourages kids to use their imagination and engage in unstructured play. Slides, balance boards, xylophones and bongos are sure to keep young ones occupied while bistro tables and chairs nearby allow parents to keep watch. That is, if they're not busy playing themselves! 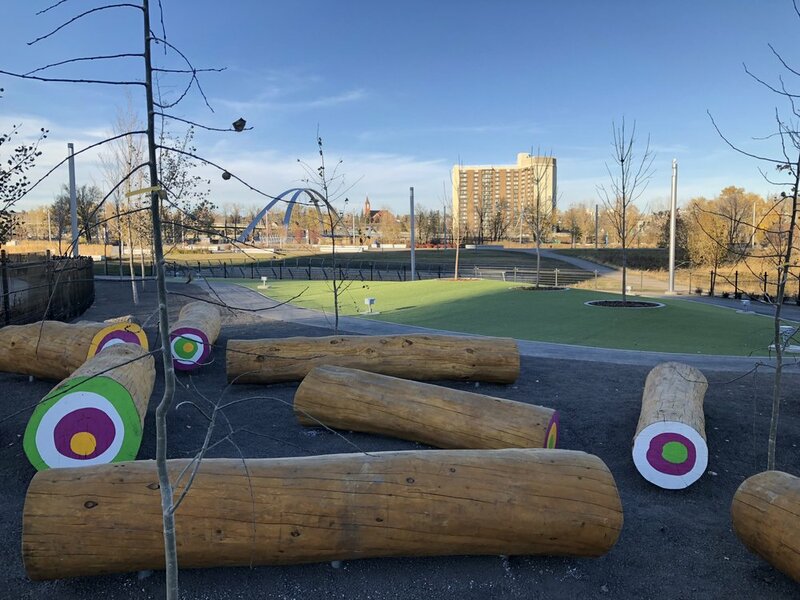 This fully fenced park features seating, agility elements, double-gated entry and exit to mitigate any conflicts with the adjacent pathway system, landscaping, wheelchair accessible paths, and a durable turf that will stand up to all the fetches and catches.